Tag Archive | "prince william"
Prince Harry is expected to host a post-royal wedding breakfast at the Buckingham Palace on Saturday. The meal, which will feed the tired and all-night party guests, will be served at 6 in the morning. Prince William’s younger brother and best man, Prince Harry, is also taking the extra role of a party planner as he organizes the wedding’s evening reception, a private party for around 300 guests, which consists of the bride and groom’s closest friends and family. According to reports, Prince Harry wanted to make an evening post-royal wedding that his brother and his new sister-in-law, Kate Middleton, will never forget. The royal brother’s grandparents, Queen Elizabeth and Prince Philip, will leave the Buckingham Palace for the younger generation’s wedding reception party. They will stay at the Windsor Castle. It appears that Prince William and Kate Middleton will have two Royal Breakfasts after the wedding. The Queen will also host a Royal Breakfast for the newly-weds in their honor. This will be served right after the wedding ceremony on Friday at Westminster Abbey while Prince Harry’s royal wedding breakfast will be served in the morning, and it will signal the end of the celebration. Prince Harry has asked a DJ to play in the early hours of the party. Thus, guests who will stay up all night will be served with a royal wedding breakfast. 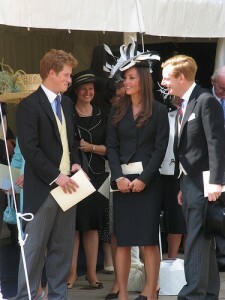 According to ABC News, Prince Harry ordered the caterers to serve bacon sandwiches, as well as “fry-ups” for the guests. Getting a gift for someone who is about to have everything in less than a week is a mind-wrecking job, but Kate Middleton’s family rose to the challenge and got her the perfect gift – a coat of arms. Kate’s parents, Michael and Carole Middleton, custom-built a family crest to highlight their daughter’s royal wedding on the 29th of April, barely a week from now. Working hand-in-hand with an artist from the College of Arms, the Middletons fashioned a coat of arms shaped like a lozenge and is hanging from a blue ribbon; the ribbon signifies that Kate is still officially single. The three acorns in the coat of arms represent Kate and her other two siblings Pippa and James. On the other hand, the oak tree is a symbol of the place where the family lived and grew for 30 years – west Berkshire. Other details like the division on the middle of the crest is a lose representation of the family’s last name, Middle-ton. The gold chevron symbolizes “Goldsmith” which is Carole’s maiden name. Thomas Woodcock, the artist who helped design the crest, said that although having a coat of arms is not compulsory, it might come in handy as she is marrying the Prince of Wales. Artists will remove the blue ribbon after the wedding and place Kate’s shield in the middle of her husband-to-be’s coat of arms, signifying that the two has become one. 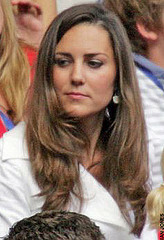 Some aristocrats, however, rolled their eyes on the Middleton’s family crest; saying that the crest should have included balloons as the family started in the party supplies industry. Although the public has learned to accept that Prince William is marrying a commoner, some members of the British royalty have not. The Crown Prince of Bahrain, Prince Salman bin Halmad al-Khalifa, declined the invitation to attend the wedding of Prince William to Kate Middleton. The Crown Prince said he regrets not going to Britain’s royal wedding but in light of what is going on in his country, he respectfully declined thru a letter he sent on Sunday. In the past few months, Bahrain government has been unsettled because of a growing outcry for more freedom from a group of people. Since February of this year, at least 30 pro-democracy individuals have already been killed by the country’s security forces. Moreover, Prince Salman’s father also sought the assistance of Saudi Arabia in sweeping off demonstrators from the streets. Now, more than a hundred of them are sent to jail. When the invitations were sent to the Crown Prince of Bahrain, the media criticized what they call an insensitive move from the British royal family. Although Prince William and Prince Salman are old friends, the Clarence House’s Foreign Office advisers (the ones who helped in the guest list) should have withdrawn the invitation as the situations in Bahrain continued to worsen. Prince Salman bin Halmad al-Khalifa said in his letter to Prince Charles, father of the groom-to-be Prince William, that he intentionally delayed sending his letter of regrets because he was hoping that the conditions in his country would improve and he wiould have the chance to join the wedding. Reports say that the Royal Family understood Prince Salman’s decision completely. Speculations say the dress had sparked the interest of Prince William for the British brunette when he attended the fashion event at the University of Saint Andrews in Scotland. The black-see through dress designed by Charlotte Todd was a hot item at the auction room in central London. It was being sold for a total of $126,000 or 78,000 pounds, which includes the commission. The massive amount has exceeded the estimated selling price of 8,000-10,000 pounds by the Kerry Taylor Auctions. Middleton was only 20-years-old when she strut the knitted dress on the catwalk during a fashion show at the university where she and William were students. Prince William was then siting in the front row during the event. Reports say a friendship blossomed between the two after the show. The dress, which originally costs £30 to put together, was intended to be worn as a skirt. But, Kate had worn it as a strapless dress over black underwear. After two years, Todd was invited to present a garment for the yearly fashion show in Saint Andrew, and Middleton was selected to wear the dress. Todd, now 31-years old, was totally speechless after the sale. In April, when Prince William and Kate Middleton perform their wedding rites in the Westminster Abbey, they will also participate in a tradition of blue-bloods that has been observed for decades. All of Britain’s royalties have been crowned on these hollowed grounds since 1066 and most of them were wed there too. The Gothic Church, one of United Kingdom’s finest, is also home to the remains of some of the world’s most important people – Isaac Newton, Charles Darwin, and Charles Dickens. The structure of the church itself, rumored to be priced at £50,000, is already awe-inspiring with light going through the stained-glass windows and echoing corridors. The Abbey is where you will find the historical Coronation Chair where all monarchs were crowned starting in the 14th century. The chair is said to be 700 years old. Dr. Tony Trowles even said that the church is home to the widest and most beautiful collection of British sculptures. The future king’s bride-to-be will walk down the aisle beneath the Gothic arches. She will walk pass tombs of past royalties and priceless medieval paintings. Serenading her will be a remarkable organ and choir. Prince William’s secretary Jamie Lowther-Pinkerton mentioned in his Clarence House statement that the couple chose the venue because of its timeless beauty and royal history. He also said that even though the church is huge, being in the high chair still exudes a wonderful feeling of intimacy. Thousands of people visit the Westminster Abbey every day, and probably even more will visit it on the April 29th royal wedding. 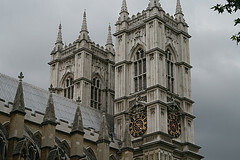 For Kate Middleton, however, the Abbey will be more than just a place where her wedding will take place; as this is also where her husband-to-be could be crowned the next King.